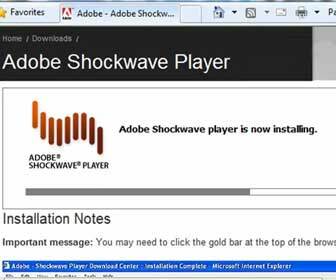 The way the Adobe Shockwave Player installs on Internet Explorer is slightly different on version 8 that it was on IE 7. The Adobe Shockwave Player is free to use. It is a good idea to have it installed in case you ever visit websites that support it. Websites that have animations and games on them are likely to take advantage of the Adobe Shockwave technology.